If you aren't an international traveler just yet, but have always dreamed of doing so, you should really consider taking a look at Canada, and, more specifically, Toronto. They are tons of reasons to visit any large city, but we found Toronto to be unique and special. Friendly people, easy to navigate, and affordability compared to the US. There really is no easier and cheaper destination for a two or three day trip...and did we mention Niagara Falls? electrical outlets are the same; no need for an adapter! There isn't much you need to plan before you depart, other than grabbing some tickets for a couple things if they are built into your itinerary. First, to avoid waiting in line for nearly an hour, grab your Niagara Falls boat tour tickets in advance (https://www.niagaracruises.com) We arranged a rental car to get from the city to the falls, but there are other methods if you don't want to commit to a car. We'd also recommend downloading the Toronto bikeshare app so you're familiar with where the bike stations are located. There are endless things to do in Toronto. For starters, the St. Lawrence Market is a fantastic place to kick off your morning or visit during lunch. We recommend mealtime because of the numerous stalls with all sorts of foods (not just Canadian food, which is, ehrm, very similar to American food). There is a main building and an auxiliary building. The smaller is truly the 'farmer's market' portion, with mountains of fresh vegetables and fruit, as well as meat, candy, etc. Across the street you'll find the larger building that holds the semi-permanent stalls, cafes, and other businesses. These aren't full blown restaurants, rather you should think of them as refined street vendors, but they are perfect for grabbing a quick bite and avoiding any sort of wait. This is one of the many pieces of art found in the distillery district: it's a very scenic area, so take your nice camera with you on this part of your trip! I hope the name of this district informs you that it isn't something you want to do in the morning. It's a very unique area to spend the evening and also shouldn't be associated with only adult beverages because there are plenty of restaurants. The ambiance is something special, and it shifts as nightfall approaches. We also found that the area wasn't as touristy as you would expect, with locals bustling around, having drinks, shopping, and generally just having a good time. You can find everything here, from dinner to desert, and some very good cocktails. We had our dinner at the Archeo Restaurant and some extremely fancy drinks at Cluny Bistro. Make sure you explore the entire area, as there are different sorts of artwork and sculptures sprinkled throughout the plazas and street corners that make for some fun photos. We found the bikeshares across the city to be super easy and affordable. Like many cities, traffic is an issue, and if the weather is pleasant and you're willing to expend some calories, you can easily get around via bike. If you've downloaded the app, you can see all bike stations and two bits of important information: how many bikes are checked in and how many empty spots remain. You'll pay only $7 for access to the bike for 24 hours, with an initial duration of 30 minutes for the rental. What does this mean? It means you pay nothing past the $7 for 30 minute intervals. If you have a bike checked out for 35 minutes, for example, you would pay an extra $1.50, which grants you the bike up to 60 minutes. If you have a bike checked out for more than an hour, the price jumps to $4 (in addition to the $7 you paid up front). So I bet you're thinking, "Wait, this isn't so affordable?" Well, yes, if you keep a bike checked out for3 hours it will cost you $14, however, utilize the app and make pitstops at stations. We crossed the entire city and never paid extra because we checked our bikes in before 30 minutes (a rest break is nice anyway), and then immediately checked out new bikes. This is a perfect strategy and you are only really penalized if you aren't doing your part of 'sharing' the bike (checking it in somewhere else, shuffling them around, etc). Obviously we didn't have time to do *everything* we wanted in Toronto. In fact, part of the reason we were even there was to watch some sporting events that our best friend was competing in at the Invictus Games (haven't heard of it? Google it! Arranged by Prince Harry for the world's wounded warriors). Thus, we didn't have the full three days to ourselves. 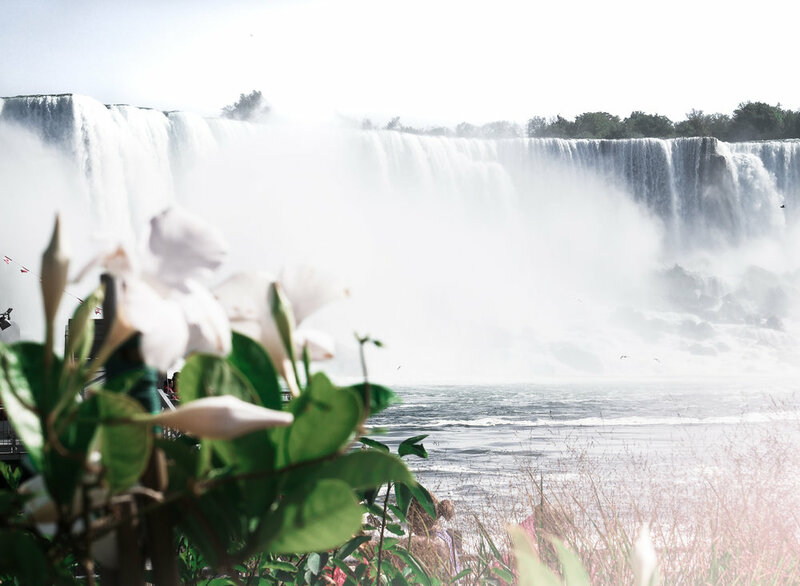 If you plan a trip, in addition to what we've described here, you should check out the CN Tower, China Town, etc, but definitely make the trek out to Niagara Falls as well. Sure, it's not really technically Toronto, but it's one of the main reasons people fly into/drive to Toronto. This photo was captured after we offloaded from the boats that go up to the falls. To get this angle, you'll need to take the boat tour! These waterfalls are truly epic. Let me say this first: the boat tours that go to the base of the falls ARE TOTALLY WORTH IT. There's a couple reasons why: if you're visiting during the warmer months, you'll find there is little shade along the upper path by the falls. In fact, you'll be sweating, baked in the sun, and surrounded by every nationality you can imagine struggling for selfies with these marvels of nature. If you pay the small fee of $25 for your ticket (that you got in advance, right?) you get access to a lovely little village/beer garden area at the base of the cliffs along the river. You are essentially shuffled down to this area like cattle via some elevators, however, once you get there, you'll find shade, food, and more importantly, cold crisp beer. You don't have to jump on the boat right away. It's perfect to sit, hang out, recompose yourself after all of the walking, photographing, posing, and sweating you did on the upper portions of the falls. Have a beer or three, right? Once you're ready, you can grab a free poncho and jump on the boat (it was about a 10 minute wait for us). If you've watched the video, you'll see it's a bit moist once you get close to the falls. You'll need a waterproof camera of some sort if you want video/photos. I love my GoPro for this very reason, which is what was used in that scene of the video. If you want the best, go for the Hero5 black: (http://amzn.to/2kfmUqQ), but if you just want a basic waterproof camera, the GoPro session is cheaper and works great as well (http://amzn.to/2i9qbnu).